Most people should be familiar with cut and paste. Just select the songs you want to move and either press Ctrl+X (or choose Cut from the Edit menu at the top). Choose your pasting point, by clicking on a song in the playlist. Then press Ctrl+V (or choose Paste from the Edit menu at the top). The cut songs will be pasted after the pasting point song. Since you cannot paste before the first song, you’ll have a secondary step of dragging the old first song down to its proper spot. So is there a workaround to directly paste to the absolute top of the list? Well, yes there is and it involves Spotify local files. Local files are normally used when songs aren’t available on Spotify (e.g., Taylor Swift). You can integrate your own physical files (e.g., MP3) which work just like streamed Spotify songs. They can be added to playlists and will even sync with mobile devices. 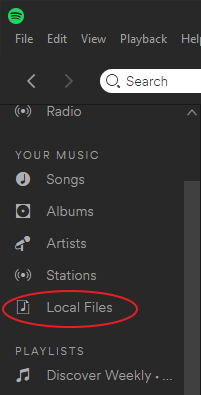 I believe by default Spotify uses your computer’s music and/or iTunes libraries, but you can specify any folder you want by setting it as a local file source in your Spotify desktop settings (Edit menu > Preferences). So what you do is copy a special-purpose MP3 I created to a Spotify local files folder source. It’s one-second of complete silence and can be downloaded here. (Use File Explorer or whatever means you want. Obviously, unzip before adding.) The song “Paste to top of Spotify playlist track” by [email protected] will appear in the Local Files playlist located at the bottom of YOUR MUSIC (Catchy title I know). 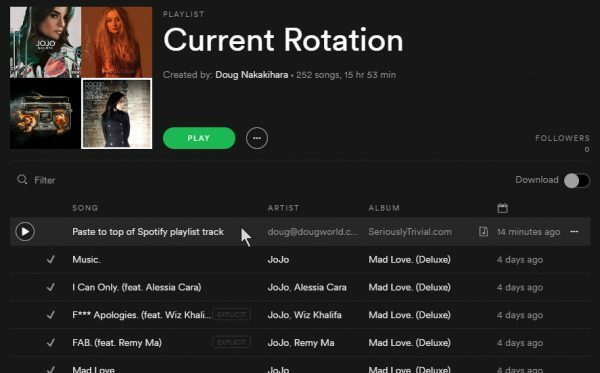 Add the song to a playlist and drag it to the top. If you would prefer not using the file I created, do the same thing with an MP3 that isn’t on Spotfy. If you don’t have one, just edit the ID3 tags of any MP3 you do have to make it not match a real song. After you add it to a playlist, physically delete the MP3 file outside of Spotify. The song will remain in the list but become ghosted. Now, just use the cut-and-paste method described above, selecting the special top song before pasting. Voila! Songs effectively are pasted at the top because my MP3 is a barely noticeable one second of silence (or if using a ghosted file, it won’t play at all since Spotify can’t find it). You can also copy the special song to the top of other playlists where you want the same functionality. If you are using the ghosted-song method, make sure you have the Show unavailable songs in playlists option enabled in settings. Otherwise, you won’t see the ghosted entry. That’s it. Pretty easy really, particularly if you already use local files. Enjoy!